Ravana the asura king, due to the boon granted by Brahma, which made him invincible from the wrath of any gods and goddess misused his powers to terrorize the Gods. Fearing Ravana and for protection the gods chose to enter the bodies of birds. Indra (also known as the Lord of Rain) chose to enter the body of Peacock. Pleased with the protection by the Peacock, Indra bestowed a boon on the peacock that it would never be afraid of snake and it would have a thousand ‘eyes’ on its fan-tail. 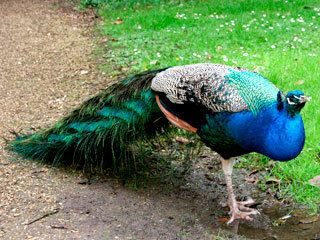 It is also mentioned that due to this close association of peacock with Indra it shows its delight by dancing whenever it rains. There are numerous instances in Ramayana and Mahabharata where the Peacock holds a special place. The famous ‘Peacock Throne’ (Takht-e-Tâoos) of the Mughal Emperor Shah Jahan is one of the most popular pieces of art and sculpture that depicts the Peacock. Shah Jahan had the famous Koh-i-noor diamond placed in this throne. Peacock has been carved in Bronze statues of Skanda from the period of Chola (11 century AD), in Vijanagar art and appears on silver coins of Kumaragupta I. It has replaced an absentee lover in Pahari painting of 18th century AD, adorned a Rajasthani Ivory Lamp, enameled in design in inner royal apartment in Udaipur (17-18th century AD). - ‘A pageant of Indian Culture’ by Asoke Kumar Bhattacharyya has an entire chapter (Chapter 16) dedicated to The Peacock in Art and Literature. Hence this site that solely concentrates on exploring and discovering India, her past, her present and her future derives it name from the majestic and beautiful bird that symbolizes India. So, lets discover and explore India – her past, her present and her future - making Mayukhi.com truly ‘Yours India!’.